GALION — Senior Brevin Owens played in his final regular season match Thursday for the Galion Tigers boys golf team and coach Bryce Lehman. He carded a 44 against Mid-Ohio Athletic Conference Red Division rival Marion Harding to contribute to a Galion victory, 171-194. “It was tough tonight knowing it was Brevin Owens’ last match as a senior,” Lehman said. “He struggled early in his round, which I’m sure was some nervousness, but he pulled himself together and finished pretty well. Owens has been golfing since he was seven years old. He is 17 and saying goodbye to competitive golf. He will not be competing in any other sports for the blue and orange for the remainder of his high school days. Once those high school days are up and he has received his diploma, Owens plans to attend The Ohio State University to major in wildlife management. The win over Harding was Galion’s fourth victory of the week. Medalist was Mitch Dyer, shooting a 41. Jack McElligott had a 42. Owens and Kaleb Harsh each shot 44. Drop scores for Galion were Matt Kingseed with a 45 and Colten Skaggs with a 46. “It was great to see my varsity guys all shoot below 46 tonight,” said Lehman. Losing a strong, contributing senior is tough, but Lehman is very optimistic about next season. “I welcome back the other five varsity players next season, so we will be stronger with this season under their belts,” he said. 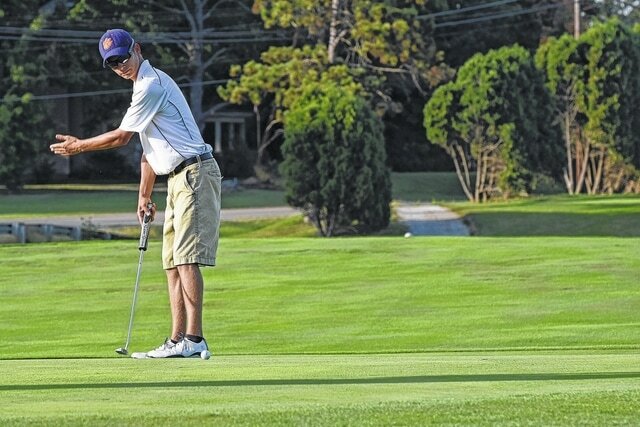 Sectional competition begins for Galion on Thursday at Sawmill Creek Golf & Racquet in Huron. Galion’s Colten Skaggs blasts out of a bunker on the par-3 13th hole Thursday as the Tigers hosted Marion Harding at Sycamore Creek Golf Course. Photo by Don Tudor. http://aimmedianetwork.com/wp-content/uploads/sites/38/2016/09/web1_Galion-golf-Sept.-22.jpgGalion’s Colten Skaggs blasts out of a bunker on the par-3 13th hole Thursday as the Tigers hosted Marion Harding at Sycamore Creek Golf Course. Photo by Don Tudor. Galion golfer Brevin Owens tries to coax a break out of his putt Thursday as the Tigers took on visiting Marion Harding at Sycamore Creek Golf Course. Photo by Don Tudor. http://aimmedianetwork.com/wp-content/uploads/sites/38/2016/09/web1_Galion-golf-Sept.-22-2-.jpgGalion golfer Brevin Owens tries to coax a break out of his putt Thursday as the Tigers took on visiting Marion Harding at Sycamore Creek Golf Course. Photo by Don Tudor.